Loudest - dual siren alarm can be heard up to nearly 300’ away. Most user-friendly - sleek, modern and compact design makes alarms easy to carry. Convenient - keychain design is perfect for use with house keys or car keys. Broad consumer appeal - a self-defense option for any age. Keychain attaches to backpack, purse, etc. for convenient, instant access plus greater value with batteries included. Built-in LED light - also offers an extremely bright white LED light, activated by pushing a button. It could be used to illuminate a dark pathway, find a keyhole in a car door, or simply provide light where there is none. 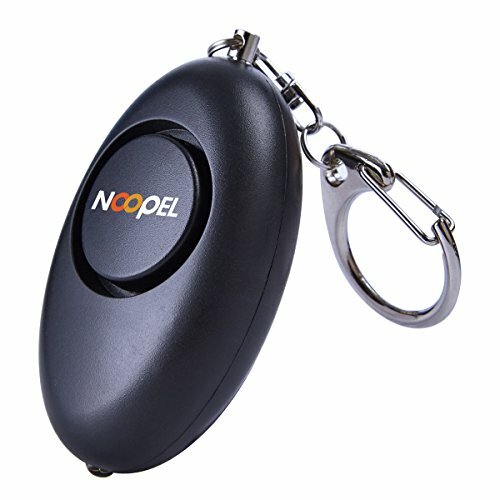 - Pull off the hand strap to activate alarm (To turn off the alarm,insert the hand strap to the plug). - When the alarm sound goes low, please remove screws from back cover and replace new batteries. - The alarm sound is very loud, please do not put by your ears. If there is any defect,you can exchange it. Within one year, any quality defects caused by non-artificial reasons, we will maintain freely.